In the world of sports watches, Coros is a bit of an unknown quantity. With its new Apex watches though, that may well change. Better known for its smart cycling helmets, Coros launched its first wrist-worn wearable in 2018 in the shape of the Coros Pace. I spent a fair amount of time with the Pace and enjoyed using it, but ultimately I came away thinking it was simply trying to ape a Garmin Watch. The Apex feels like a different proposition. It’s still all about tracking your running, cycling, swimming and triathlon antics. It comes in two sizes (42mm and 46mm), is packed with all of the keys sensors to serve up basic and more advanced metrics, has all the navigation support you could need, and boasts a big battery life. Coros also includes its new AI Trainer feature to give you a better insight into when you need to rest up between training sessions. 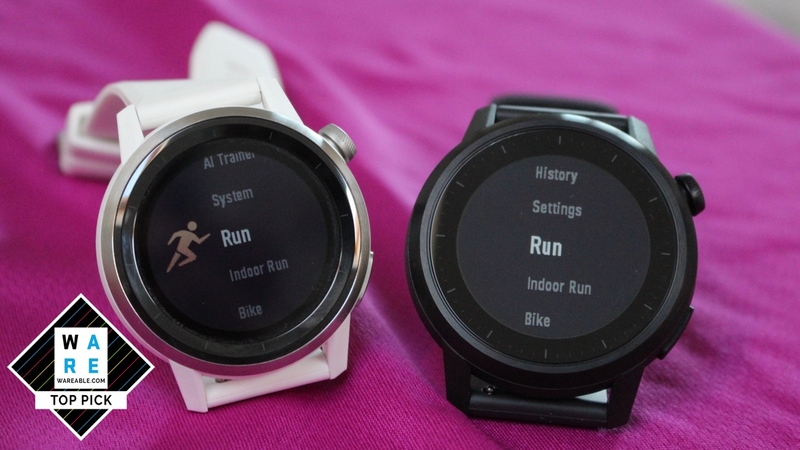 At $300 (42mm) or $350 (46mm), the Apex is cheaper than a Garmin Forerunner 645 Music and around the same price the Polar Vantage M. It’s got more in common with Polar’s watch as it should appeal to someone who's taking their sports tracking a little more seriously. We haven’t had another sports watch brand to shout about since the now-departed TomTom added sports watches to its satnav business. So could Coros fill that void? Here's our full verdict on the Coros Apex. I've mentioned it already, but when I used the Coros Pace, I couldn’t get away from thinking of it as a Garmin clone. That was mostly down to the way it looked. It's a very different story with the Apex watches. The design now falls more on the smartwatch side of the spectrum than the sports watch one. I had the black 46mm and a white 42mm to live with and I enjoyed having them both on my wrist. They simply don’t look like your average sports watch, and I was more than happy to wear them 24/7. They’re both made from high-grade materials (titanium on the 46mm, ceramic on the 42mm), feel like they’re built to last with the same 10ATM waterproofing for pool and open water swimming, and crucially, are comfortable and don't give you that horrible, sticky feeling you can often get with sports watches after a sweaty workout. I had a preference for wearing the 42mm version due to my skinny wrists, but the 46mm is by no means a hulking thing to wear. Both feature LCD displays that aren't touchscreen, but do offer raise-to-wake gesture support, which works a lot better than I anticipated. The 46mm Apex has a slightly larger 1.2-inch display in comparison to the 1.1-inch screen on the 42mm, and the bigger size also gives you a bump in resolution. It does actually make a bit of a difference from a visibility perspective with the Apex's bigger screen feeling just a tinge brighter. That’s not say we had any real issues with the smaller one in use, though. Both use silicone straps and I’m happy to say that I’ve not had any rash or skin irritation issues to report. The straps are interchangeable as well, using a quick release mechanism to swap out the 22mm (46mm) and 20mm (42mm) bands out for new ones, which will set you back the same $30 it would cost to buy additional official straps on rival sports watches. In terms of navigating screens on the Apex, there are just two physical buttons. The one in the top right hand corner is a bit like a watch crown; it can be satisfyingly twisted to glide through screens and tapped to launch the activity tracking menu screen. The bottom button is essentially a back button that takes you to the previous screen. You can also hold it down to access features like the timer, stopwatch, Do Not Disturb mode and to change the watch face. Two-button navigation is fine. It keeps thing simple, and the combination of the two works nicely. Coros focuses on the core sports and leaves out the likes of paddle boarding and any winter sports. So it's got you covered for running, cycling and swimming. There are indoor modes for cycling and running too, and it'll also track open water swimming. There's also an additional triathlon mode so you can track transitions during training and on race day. Coros is planning to roll out a host of navigation features to both watches to enhance the Apex's use for trekking and hiking. These include the ability to pre-load routes, receive off-route alerts and see the distance to your destination. Back to sports tracking though, and getting started couldn't be any simpler. Tap the top-right button on the watch to open up the tracking menu screen and then twist the same button to scroll through your options. What I really like here are the well-placed secondary modes you have for each sport. Take running for instance, which also offers interval training as well as aerobic and anaerobic training modes. There's also a whole host of settings to tinker with to better tailor your training sessions. As a running watch, it's a solid performer. I've spent a fair amount of time training and racing with both Apex watches, and both serve up similarly good results. In my earlier runs and races (10km distance) GPS accuracy seemed a little off, but it seemed to level out after those initial issues. Switching to the GPS+GLONASS mode also swiftly rectified any concerns about mapping accuracy. During a run, the data screens are easy to digest and there's plenty beyond the metrics basics to explore here. Thankfully from a syncing point of view, these watches don't keep you waiting long to look back over that workout data. Syncing is seriously speedy, even for sessions longer than an hour. I've seen syncing on other sports watches labour in comparison so this is definitely a big plus point for Coros. For swimming, the Apex performs well too. I've only tested them in the pool where you can pick pool size, turn on distance alerts and even turn off the white background to improve screen visibility in the water. All the key metrics are covered, and the twisting physical button on the watch makes it extremely easy to scroll through different data screens. It doesn't do anything out of the ordinary on the swim tracking front, but it's in the app post-swim where the Apex delivers the goods. From the companion app you can see a pretty comprehensive breakdown of your session including strokes and a breakdown of each lap including stroke style, distance, time, average pace and SWOLF. Away from tracking, Coros also wants to aid recovery and keep you in good shape for your next tough training session. This takes the form of its AI Trainer which delivers a number rating system based on stamina level and training effect. These numbers are based on effort levels and training history. It works in a similar fashion to Garmin and Polar's recovery-centric features and relies on the data the sensors record being on the money to make this information reliable. Overall, it's all good news. If you care about sports tracking, the Apex watches do deliver. While it's all been very positive so far, we have to talk about arguably its most frustrating aspect – heart rate tracking. The optical sensor on the back of the watch works much in the same way as the sensors you'll find on rival sports watches. Coros lets you monitor heart rate continuously, offering resting heart rate data from the past six hours. The other use is for tracked training sessions whether you're working on intervals or governing a race or event by heart rate. Based on my experience of both uses of heart rate monitoring, there's more bad than good. Starting with resting heart rate data, which generally tends to be excessively higher (sometimes 20bpm more) than when I compared to the Garmin Forerunner 935's sensor and a Polar H10 chest strap. When it comes to using heart rate for workouts, it really is a mixed bag. On some initial very evenly paced runs, the heart rate data appeared consistent with the chest strap I put it up against. But then it would also produce data that was 15-20bpm off the chest strap when I peered down at the watch during sessions. The experience seemed to vary across the two watch sizes. In the app, the graphs indicate a more consistent picture as far as the data recorded is concerned. The numbers displayed on the watch just seemed to be excessively high on occasions. It was the same for high intensity training as well. Hopefully this is a software issue more than a hardware issue, but I wonder whether it might be a combination of both. All in all, it leaves the Apex's heart rate tracking powers with room for improvement. While it may not look like it, the Coros Apex does offer activity tracking, which is discreetly hidden within the watch face but is far more apparent inside the Coros app. What's less obvious is the fact that it does sleep tracking too, offering a breakdown of your sleep along with your heart rate range and average heart rate. From an accuracy point of view, I didn't see anything too alarming with step counting compared to a Fitbit Versa and the Garmin Forerunner 935's fitness tracking features. Sleep monitoring seemed pretty consistent here too, but these are definitely features you need to actively want to seek out over the more serious metrics. As far as doubling up as a smartwatch goes, the Coros keeps things basic. All you're getting here is notifications that you can only read and dismiss. A little vibrating buzz will alert you to an incoming notification, and you use the twisting button to scroll through longer messages and other queued up notifications. One thing I have found is that if you don't deal with those notifications the first time they come through, you can be incessantly buzzed to read or dismiss them. The Coros app has come on leaps and bounds since I first encountered it with the Pace. It's slick and packed with data if you want to go deeper into your tracked sessions, but the core elements are what you'd expect from a fitness app. You've got your dashboard for the day, a feed of previous workouts to check your medals (read achievements) and a place to customise data fields you can view when you're tracking. On the compatibility front, the Apex plays nice with ANT+ accessories, letting you pair it with heart rate monitors. And in what will undoubtedly be good news for many, it has the ability to connect to Strava and TrainingPeaks, two pretty essential apps serious athletes will want to be plugged into. If there's one feature that stood out more than any other feature on the Apex in my time with both models, it's the battery life. These watches really can go the distance and barely make a dent when you're putting those sensors to use. Coros claims you can get up to 30 days of regular use with the 46mm Apex and 24 days with the smaller Apex. In full GPS mode, it's 35 hours (46mm) or 25 hours (42mm). In UltraMax GPS mode, that ramps up to 100 hours (46mm) or 80 hours (42mm). An hour of tracking with full GPS and heart rate usually dents the battery life by around 10% or around 15% on the smaller Apex. Ramp things up to two or three hours and it's still a drop off no more than 20%. The ability to conserve that battery life between those sessions really impresses. Even with regular tracking through the week, I've usually reached for the charger after two weeks of use. There's a lot to like about the Coros Apex. It looks like a good sports watch, it delivers on the tracking and data front, and that battery life is impressive. But there's no ignoring that heart rate performance, especially if you're banking on basing the majority of your training around it. Thankfully you can pair a chest strap to remedy the problem. If Coros can firm up the HR performance, then what you have here is a $300 multisport watch that's a solid alternative to the Garmins and Polars at the same price. ha ha yes, it does look like the Garmin Vivoactive doens't it. nice review. battery life seems amazing.